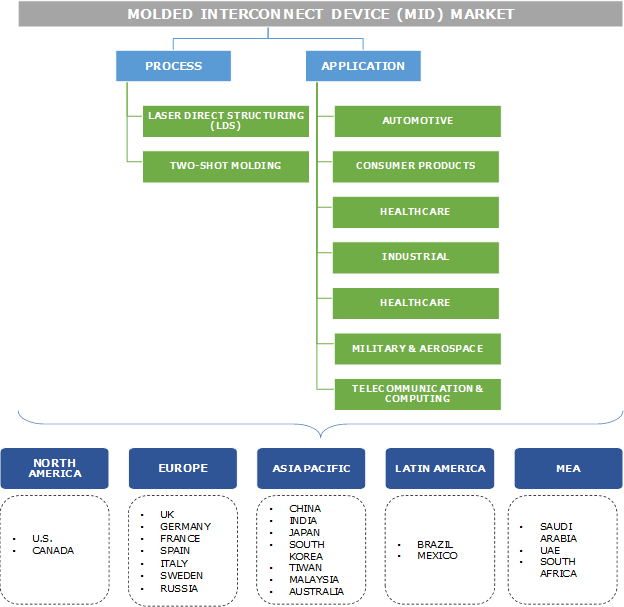 Molded Interconnect Devices (MID) Market size was estimated at over USD 320 million in 2017 and is predicted to grow at a CAGR of over 12% from 2018 to 2024. The molded interconnect devices market is likely to exhibit growth over the forecast period owing to frequent technological advancements in telecommunication and consumer product applications. Rising proliferation of smartphones and surge in adoption of smart wearable devices are expected to offer stimulus to the industry growth. MID combines with various other internal parts such as connectors, circuit boards, and cables, among others, improving the circuit density and eliminating various combinations of components as in the case of PCB circuits. The technology enables miniaturization of devices including smartphones and automotive light fixtures by reducing assembly time and space-saving circuitry. The cost-effectiveness of the technology can be attributed to fewer parts required for assembly as compared to traditional PCB circuits, driving the growth of the molded interconnect device market. The design flexibility of such devices delivers high product reliability and less requirement for auxiliary parts. Eco-friendly and recyclable components alleviate the necessity and the demand for such devices across end-use verticals. Environmental benefits of the technology, such as recyclable thermoplastic materials and elimination of hazardous flame-retardant manufacturing process, are expected to drive molded interconnect devices (MID) market growth over the next six years. The MID market has been challenged by the lack of widespread adoption owing to low awareness, high technological expertise for manufacturing, and the presence of only a few vendors offering MID products. However, with constant innovations in consumer products technology and the rising demand for the miniaturization of products, the molded interconnect devices market has gained momentum over the past few years. Laser Direct Structuring (LDS) process is anticipated to surpass USD 300 million by 2024. This technique employs the use of a single-shot molding process to generate the physical part of the MID. The segment is predicted to witness growth due to low tooling and development costs associated with the LDS manufacturing process. Furthermore, the simplicity of LDS process, better environmental benefits offered than traditional methods, and the elimination of hazardous chemical pre-treatment such as etching are expected to foster the LDS-processed MID market growth. Telecommunication & computing segment accounted for over 55% of the global revenue in 2017 and is anticipated to grow due to the exponential demand for antennas. The sharp growth of the smartphone industry has resulted in an increased demand for MID antennas. Furthermore, the demand for wireless-enabled computing devices such as laptops, notebooks, and printers & routers is expected to offer additional revenue growth opportunities for industry participants growth. The proliferation of smartphones, tablets, and other smart connected devices over the past few years has enabled development, popularization, and the adoption of MIDs. Healthcare molded interconnect devices market is anticipated to grow at a CAGR of over 15% from 2018 to 2024. Surging adoption of in hearing aids, IV regulators, dental tools, temperature sensors, insulin pumps, and cauterizing tools are expected to fuel the demand over the forecast timeframe. Healthcare prototyping requires a considerable amount of research & development time along with rigorous testing. Molded interconnect device manufacturers work closely with healthcare professionals from prototyping through production to match the specific needs of medical device construction requirements. The Chinese molded interconnect devices market is anticipated to dominate the industry be exceeding USD 155 million by 2024 owing to the rapid demand for MIDs in consumer electronics applications. Ease of manufacturing and availability of low-priced parts in China have favorably impacted the Asia Pacific molded interconnect device market growth. The growth of smartphone manufacturing industry in the region and the availability of a large number of component and material suppliers in China, South Korea, and Taiwan have favorably impacted regional MID market growth over the past few years. 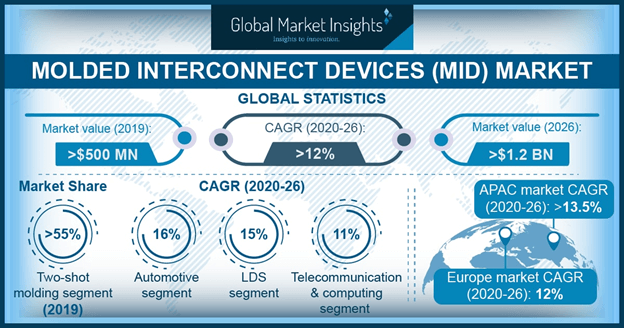 The European molded interconnect devices (MID) market is projected to grow at a CAGR of 10.5 % from 2018 to 2024. The presence of a large number of prominent automotive OEMs in the region, particularly in Germany, France, and Italy, will promote industry growth. The surge in the provision of automotive electronics and advanced features by automotive OEMs has enabled the development of MID for applications such as seatbelt safety systems, positioning sensors, light fixtures, etc. The German molded interconnect devices market is characterized by the presence of some prominent vendors such as LPKF Laser & Electronics AG, Harting Mitronics AG, and Teprosa AG, among others. The global molded interconnect devices market is dominated by a few prominent vendors including MacDermid Enthone, Molex, LPKF Laser & Electronics, TE Connectivity, Harting Mitronics AG, SelectConnect Technologies, and RTP company. Rising investments in the research & development for expanding MID applications would provide opportunities for industry growth. For instance, consumer electronics manufacturers are increasingly focusing on the production of television sets using a thermoplastic substrate that is easily recyclable and can be designed without halogenated flame retardants that cause harm to the environment. The use of such materials enables television manufacturers to incorporate MID technology into the device. Electronic component and connector device manufacturers have expanded their capabilities to include multiple manufacturing processes. Partnerships with thermoplastic material suppliers enable manufacturers to develop specific material formulations for the manufacturing process. For instance, Harting Mitronics worked with Ticona, to develop commercial LDS sensors, antennas, connectors, and security applications made of LCP. Engineering-resin makers, such as DuPont, Ticona, BASF, Lanxess, Degussa, etc., have been focusing on innovative processes and the provision of new materials for manufacturers. For instance, DuPont has developed a palladium catalyst doped plateable LCP for two-shot molding in a move to foster the growth of MID applications. Furthermore, Lanxess has developed LDS material, the Pocan TP polyester grades with a wide processing window suitable for lead-free soldering, reflow, and vapor-phase soldering. The benefits of the technology including less auxiliary parts, design flexibility of the products, and recyclable eco-friendly components have propelled the demand for the technology. Furthermore, the molded interconnect devices market is foreseen to gain momentum over the next six years due to the heightened awareness and rising applications in the automotive and consumer product verticals. However, high-cost chemical elements required for the production process, high tooling costs, and low circuit density are expected to serve as pitfalls for MID market growth over the coming years. Selective metallization offered by these products is anticipated to drive MID market growth over the coming years. Techniques including laser direct structuring of chip assembly on substrates are expected to propel industry growth. The use of high-cost chemical elements, such as thermoplastics or precious metals for plating materials including gold and silver, is likely to increase the raw material price, which would negatively impact the pricing trend. Furthermore, the high tooling costs of these products are expected to serve as pitfalls for the acceptance of the technology.